I got a phone call from Eastpak & Jansport the other day. They had received a new shipment of bags including some limited edition versions and the guy wanted me to pass by and check them out. So, tonight I passed by with Nat and nibaq to check out the new stuff. Nibaq is still looking for a messenger bag for his new powerbook and I told him he might find something cool there. They always have some really cool stuff, so cool that I always wish I was going on a vacation or something so I could buy a good bag. Last time I travelled I had a terribly small and uncomfortable backpack and I really regret then not getting a better one. This time around when I travel I am gonna get the best backpack I can afford. 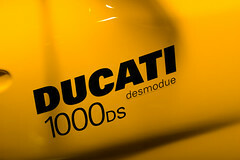 The coolest thing in the showroom ofcourse is the bright yellow Ducati 1000DS motorbike, and you can have it for only KD3900!